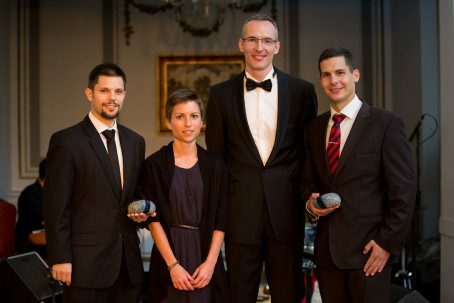 This year two project teams have been awarded in Hungary by the prestigious Gran Prize Award: Dr. Tamás Haidegger and his team for Semmelweis hand hygiene scanner, and Dr. István Kézsmárki and his team, MTA-BME Lendület Magneto-optical Spectroscopy Research Group, for development of Novel Malaria Diagnostic Methods. Sigma Technology co-sponsored the Award Ceremony and was also represented in the Gran Prize Board selecting the winners. The Gran Prize honours those working on outstanding solutions to the most urgent and crucial challenges, which the planet faces today, in the field of environmental protection, sustainable development, human rights, medicine, health protection and development, or education. The prize was started by the Swedish Chamber of Commerce in Hungary four years ago, and Sigma has been an avid supporter from the beginning. The Gran Prize 2016 winners have both worked on the projects that aim to improve the quality of living and medical diagnosis. One of the winners, HandInScan, gives the users objective and personalized software-based feedback on the quality of their hand hygiene. The innovative technology is based on validated evidence-based IT methods tested on over 17,000 healthcare workers. The method provides real-time evaluation of hand rubbing, which is a compulsory protocol at healthcare institutions, biotech facilities, and in the food industry. The general objective of the Semmelweis scanner is to provide quality-assured hand hygiene control to people potentially saving thousands of lives. Dr. István Kézsmárki (represented by project team members Ádám Butykai and Ágnes Orbán during the award ceremony), leader of the Novel Malaria Diagnostic Methods group, which has also been awarded, initiated the development of two malaria diagnostic methods and supervised the project teams. Their highlight achievement is the development of cost-effective and highly sensitive automatized malaria diagnostic device that is based on a simple off-the-shelf laser diode and permanent magnets. The first validation steps, performed on laboratory parasite cultures and infected mice, underlined the extreme sensitivity of the instrument qualifying it as a potential candidate for in-field diagnostic use. For more information, please contact György Nagy (gyorgy.nagy@sigmatechnology.se).